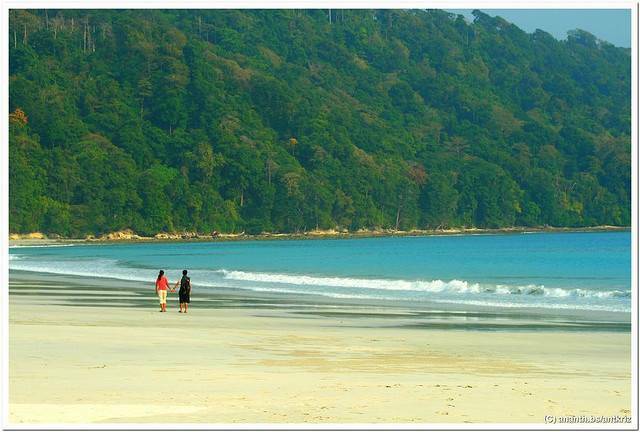 “Best Beach of Asia-2004”, Radha Nagar Beach is located 3 km from the Havelock Island on Island’s western coast. Scuba Diving and Snorkeling are available to explore the marine life and corals. White sandy shore and crystal clear sea water enthralls you. Leisure walks on the long and wide sandy shore will relieve your stress and relaxes your soul and body. Sunsets in this beach enhances the scenic beauty of Radhanagar Beach. Kids and even adults should miss the elephant rides at reasonable rates. Since not being commercialized, the beach is calm and tidy. You can come across many foreigners indulging in beach volley ball.